Aluratek's Bluetooth Wireless Sport Earbuds delivers hands-free convenience and superb stereo sound making them great fit for your active life style. For the ultimate mobile entertainment experience, ABH03F features an advanced acoustic design to produce high definition audio for deep, rich sound with impressive clarity and enhanced bass while the unique design of the earbuds reduces background noise. Stream your favorite tunes and listen to audio from your Smartphone, Tablet, PC or Mac laptop. Connect with friends and colleagues thru Skype, Yahoo Messenger, Windows Live Messenger, Gmail and AIM with the integrated microphone. Easily switch between phone calls and music with the touch of a button. Wirelessly roam up to 33 feet away from your paired Bluetooth device. ABH13F features Bluetooth v3.0 and support for A2DP (Advanced Audio Distribution Profile) which enables the stereo audio wireless link between your Bluetooth device for the best possible audio quality. The built-in lithium ion rechargeable battery provides up to 5 hours of continuous talk and listening. Charge your earbuds via a USB port on your computer with our included USB charging cable. Designed for your comfort, the earbuds are contoured to your ear, lightweight, sweat proof and features a tangle free cord. 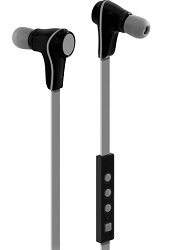 The earbuds are built with durable materials and sweat proof seals that protects them from sweat-related damage. Perfect for runners and gym enthusiasts. For the best sound performance and a secure, comfortable fit, be sure to adjust the earbuds to rest gently in your ear and drape the cord around the back of your neck. Use the provided fit kit to find the eartip that works best for you.